Stretch out in the sunshine and chat with other Metro folks at our Third Sort-of-Annual Metro Potluck Picnic, now with barbeque! For those who’ve never been to one, the potluck picnic is a great chance to put faces to usernames and chat about whatever strikes your fancy with other folks from the Metro list and meetings. Just bring food, drinks, music, or toys, and kick back on the grass, toss a Frisbee around, or practice your volleyball skills. This year, we’re moving from Central Park to the Bronx’s Pelham Bay Park, because it gives us more space to run around and the ability to barbeque. It’s about 45 minutes to an hour from midtown Manhattan, and is readily accessible by subway, bus, or car (see Directions below). Age: Any age is cool, but keep an eye on little kids. By Subway: Take the 6 Train to the last stop in the Bronx (Pelham Bay station). There’s an overpass from the train station to the Park. 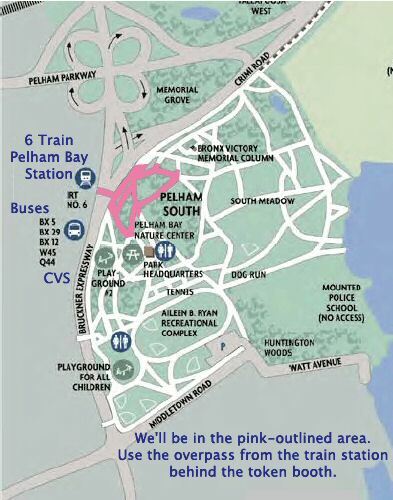 By Bus: The Bx5, Bx12, Bx14, Bx29, QBx1, and BxM7A (Pelham Bay Express Bus) all have major stops at Pelham Bay Park station (it’s an outdoor transit hub). Take the escalator, elevator, or stairs up to the train station to get to the overpass-ramp to the Park. By Car: Take the Bruckner Expressway/New England Thruway to “Country Club Road/Pelham Bay Park” exit. Or take the Hutchinson River Parkway to “Pelham Parkway East” exit. Follow the signs for Park parking lots at the north and south ends of the picnic grounds. Check the map below, and look for blue & yellow streamers and “Metro Anime Picnic” signs. Alcohol, Cigarettes (not on the grassy areas, you can smoke on the nearby sidewalk or walkways), Fireworks, Sharp Pointy objects (except for cooking tools). We’ve got a permit, and these would violate it. Food! I’ll bring burgers, hot dogs, and veggies, but everybody should bring tasty snack-type or meal-type food for sharing. Go for easily hand-held foods, and if you’ve got some cooking skills, go ahead and show them off! As for how much to bring, a good rule of thumb is enough for 20 people to have a decent portion, or a bunch more little-sized portions. We’ll have plenty of plates, cups, utensils, and napkins, so don’t be afraid of a little mess. Drinks! Anything non-alcoholic is fine, the colder, the better. I’ve got a couple of drink coolers, but it’ll be great if folks can bring a big thermos of punch or some 12-packs of soda. We’ll need volunteers for ice runs, so speak up if you want to help out with that. Music! I’ve picked up a nice boom-box that can handle MP3 players as well as regular & MP3 CDs, so if you’ve got a homemade party-ready anime/J-Rock/J-Pop music mix, burn it & bring it. Games! Anything that you can play on grass or asphalt is okay, so long as the grass/trees don’t get damaged. Other Stuff: There are some picnic tables, but you’ll probably want to bring a tarp, blanket, or chair to sit on. RSVP: Try to tell me if you’re planning to come to the picnic, and what you’ll bring. If you don’t want to cook, store-bought stuff like chips, cookies, or soda are always appreciated, and aren’t too heavy to carry. If you need potluck picnic advice, I’m happy to answer questions or offer ideas based on how much you want to carry/spend/work. The highway (I-95, aka: The Bruckner Expy) bisects the map from South to North. To the west (left) of the highway, near the center of the map, is the Pelham Bay Park station of the #6 train. It’s the orangish/clay-colored long strip (the 6 is elevated in this part of the Bronx). If you zoom in, you can even see a train pulling out of/into the station! At the end of the station closest to the highway, you can see the highway overpass that connects the train station to the park. THIS is what you’ll be crossing when you exit the station. At the base of the ramp is the entrance to the park. You’ll want to be near the front of the train since there is only one entrance/exit at Pelham Bay station. You don’t necessarily have to be in the first car, but don’t linger near the conductor’s car or anywhere further back. There are mostly reliable elevators at Pelham Bay station, if you’re carrying a heavy load. You don’t have to fear that you’ll be alone on the train in an unfamiliar area of the city. Pelham Bay Park is a popular summer destination for Bronxites, and you’ll likely have a semi-full train ride up. As I mentioned earlier, the train is elevated for part of the Bronx. Enjoy the views! Feel free to ask me for more travel info at Sunday’s meeting. I’ll have tips for drivers and bus-riders in a later message.